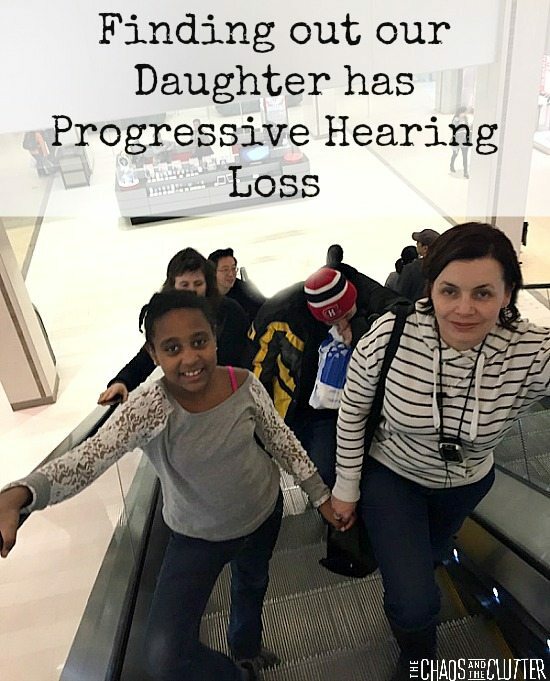 I routinely write about the special needs of our children and the challenges and successes that come along with them, but writing about our daughter’s hearing loss has been something I have had a harder time doing. It’s been a year and a half but I still haven’t been able to put words to it. The only time I have mentioned it to my readers was when she told Santa that all she wanted for Christmas was to be able to hear. Hearing loss is not the most severe of the special needs that our children face, yet somehow, it is the one that I have felt the most loss with. I have grieved and am still grieving. Hearing is one of those things we take for granted until it isn’t. I think in our case, it seemed particularly cruel that with all the other losses in our daughter’s life, she was losing her hearing as well. We adopted Dancing Queen from Ethiopia when she was 4. We also adopted her older brother at the same time and although they had each other, they had lost their mother, their father, their oldest brother, their country, their language, their caregivers at two orphanages, and for the most part, their culture. They had already suffered tremendously prior to us bringing them home and we thought the worst was behind them. As the years went on and the effects of trauma and attachment began to rear their ugly heads, it was apparent that the worst was yet to come. Dancing Queen was diagnosed with PTSD, RAD, an anxiety disorder, speech delays, and cognitive delays. Many forms of therapy followed. 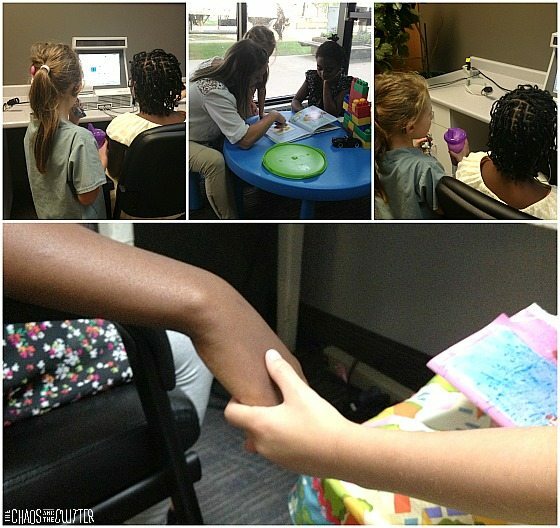 In those earlier days, one of the first steps when accessing speech therapy is to have a hearing test done. Her test came back as her having some very mild hearing loss, but only in high frequencies and nothing that would affect her speech or ability to function in life. It was recommended that another hearing test be conducted in another year. With the list of conditions that we were dealing with, the minor hearing loss was not even something that caused a blip on our radar. Fast forward a year to her next hearing test and there was a slight drop, again, only in high frequencies, but it was recommended that we get a referral to an ENT (ear, nose and throat specialist) and do some investigating. The ENT sent us for another hearing test, this time at a clinic in the hospital and for a CT scan of her brain. Everything was structurally normal and when the hearing test was conducted, we were told that it was comparable to the one done at our local health clinic the year before, so I left there thinking that this was not an issue at all. We would later find out that there had in fact been a drop and that if we had compared the two audiograms ourselves, we would have had red flags and been demanding answers. A difference of 10 decibels is considered normal because they allow for 5 dbs on either side for room for error. What we didn’t realize at the time was that on that hospital audiogram, every single one of the frequencies had dropped 10 and one had dropped 15. We should have been told but weren’t and there should have been a follow-up. It makes me sad to think of the time that we lost and of her having to compensate for her hearing because of this error. Fast forward a little more than a year. I had been noticing that Dancing Queen was having a hard time hearing me. It seemed that she couldn’t hear me at all in the vehicle (I thought it was because of the background noise, but it was actually a combination of that and the fact that I wasn’t facing her so she couldn’t read my lips. She had gotten good at reading lips and faking her way through situations but we didn’t realize that yet.). I mentioned to my husband that I thought maybe her hearing was getting worse but he didn’t yet think so. We went camping for a week that summer and when we would call her, she would never come. She would say that she hadn’t heard us, but we weren’t sure if it was her hearing or just her wanting to play longer or being distracted. We were camping with friends of ours and when I mentioned it to Cathy, she said that she had noticed it too. There were several other instances that summer that were big signs but I tried my best to ignore them. By the end of the camping trip, my husband agreed that there may be an issue. In August, I called my close friend Shannon and told her my suspicions. Shannon’s daughter Sadie has hearing loss. 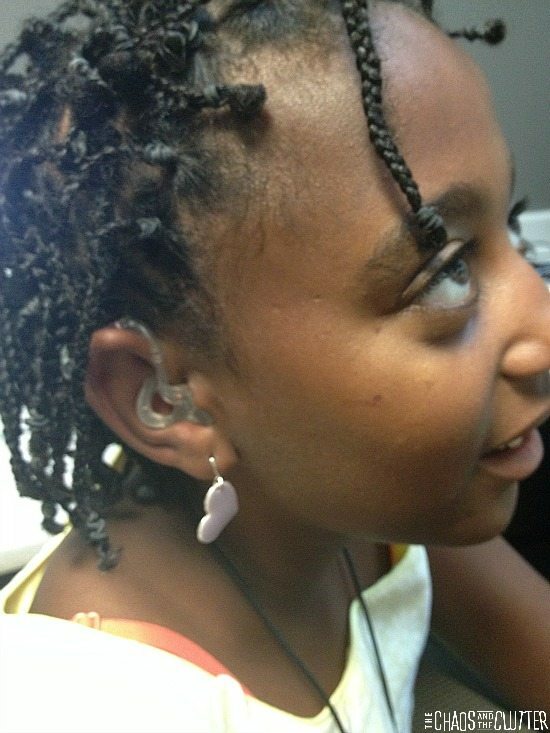 She has a cochlear implant on one side and a hearing aid on the other. Shannon immediately put me in touch with the clinic they go to. I cried during that phone call because I already knew the truth. That August, we had the audiogram done and I knew as I sat behind Dancing Queen during the test that she was going deaf. I had tears streaming down my face during the whole test as the beeps got louder and louder and she couldn’t hear them. It’s hard to describe what that felt like. Knowing that this girl who in just 8 years had already lost so much was losing one more thing seemed unimaginable. I wanted to scream about the unfairness of it all. I didn’t want it to be true. I still don’t want it to be true. I am thankful that I didn’t have to walk the road alone. My friend Shannon was there beside me when I got the results of that hearing test. She and her Sadie were there when Dancing Queen got her hearing aids. Sadie told Dancing Queen that she didn’t need to be afraid. Sadie held Dancing Queen’s hand and Shannon held mine. I am thankful that God put her in my life, knowing that this day was coming. She helped answer so many questions for me and helped me make decisions. We still don’t know what is causing Dancing Queen’s hearing loss. Her hearing has continued to deteriorate. At her last audiogram, the hearing in her left ear had dropped significantly and her hearing aids needed to be turned up again. That was only 3 months ago and she is already having a hard time hearing even with her hearing aids on, so we will be going to have her hearing tested again. I suspect the right side has had the same dramatic drop. I’ve been putting off booking the appointment because I don’t really want my suspicions to be confirmed. I know that me not wanting to believe it doesn’t change what is. Dancing Queen currently wears hearing aids in both of her ears and when we go out, I wear a Roger system around my neck. It has a microphone that speaks directly into her hearing aids. This enables her to hear me when I’m driving and she can’t lipread and when we are in a place where there is a lot of background noise. She has a hard time filtering out that noise, so there are certain situations that make it hard for her to hear well enough to get by. As her hearing worsens, we will have to get hearing aids that are more and more powerful and I will need to wear the Roger system more often. Right now because her hearing has dropped again, I am sometimes even wearing it in the house. Her speech is worsening as her hearing loss worsens, especially now that the frequencies include conversational speech frequencies. She is sometimes self-conscious about the questions we get in public, particularly about the Roger system. I tell her it’s our super special way of communicating and I make sure that I whisper “secrets” and compliments regularly into the mic. so that she feels better about it. Dancing Queen’s hearing loss has meant many changes for our family. She can’t hear much without her hearing aids and she can’t wear them in the water or when she is sleeping, so swimming and bedtime routines have had to be adjusted. I keep a light on while I’m tucking her in because otherwise, she can’t hear when we pray together or talk about the day. I talk to her swim instructors about being sure to make eye contact with her and using gesturing and hand signals when giving explanations to her. It has meant small differences in the way we and her siblings communicate with her and big differences in the way that I advocate for her. I don’t know what the future holds for our Dancing Queen. We live in a world of increasing technology and I am thankful that there are hearing aids and adaptive systems that can help her. I know that being deaf does not mean that she will be limited in what she can accomplish, but it does mean that things will be more challenging for her. 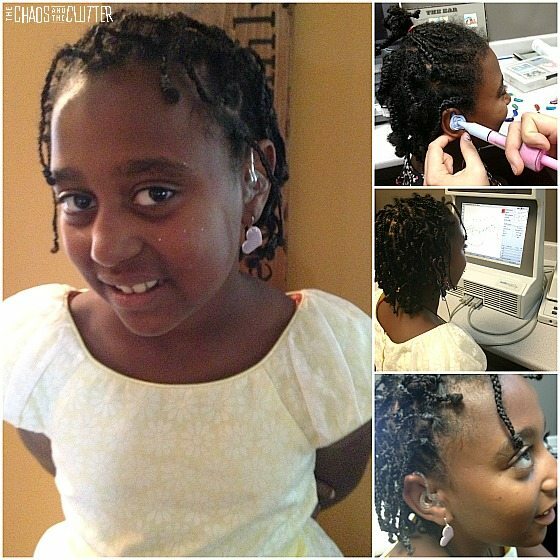 I hope that we are able to help her accept her hearing loss and see that in some ways, it may turn out to be a gift. Right now, I am still trying to work through my own feelings about this new challenge in our lives so that I can better help her navigate her way through her feelings about it. When she first got her hearing aids, she went through a time of intense grieving and “why me?” questions. It was hard to support her through that because I was struggling with the same emotions myself. A year and a half after this became a part of our story, I am slowly beginning to accept this as part of our new normal. I hope that I am able to advocate well for my daughter’s needs and to see herself as I see her, as a survivor who has overcome much more than this and who will someday inspire others with all that she has overcome. I don’t know how long it’s been since this article was published, but you should let her decorate her aids however she likes! I have purple ear molds, I decorate mine with stickers, etc. Let her be a part of this, and help her come to terms with it. Additionally, I suggest you and she learn ASL, especially if her hearing will continue to deteriorate.